A dear friend of ours recently paid us a visit, just long enough to share some wine and pizza. 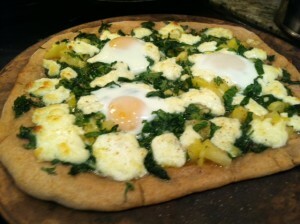 Kelly loves good pizza but is careful about her diet so I made the pizza dough and made the mozzarella. A few local tomatoes, some basil from our garden, a shave of Parmesan and a splash of olive oil and we had a memorable evening. To make mozzarella all you need is a gallon of milk, some rennet tablets, a couple of lemons, a good thermometer and a Chinois fine and/or some cheesecloth. Oh, you’ll also need patience 😉 No problem, right? Rennet comes first, start at Whole Foods or your local co-op. Or you can go online and order rennet and other cheese making supplies from Leener’s. Enough talk, let’s make some cheese. Measure out a 1/4 cup of cold (non-chlorinated) water and dissolve one rennet tablet in it. 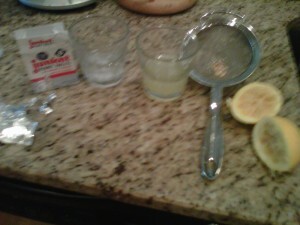 Since I didn’t have a citric acid tablet I used the juice of two lemons. Works pretty good. If using the citric acid tablet, dissolve that in a 1/4 cup of water as well. And you’re gonna need a gallon of milk, preferably non-homogenized whole milk. 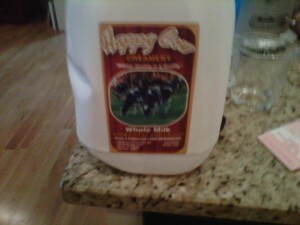 This is Happy Cow, local milk that’s been gently pasteurized. 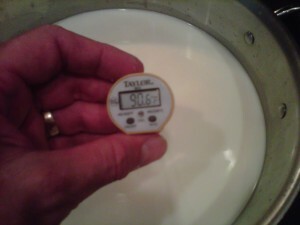 Put the milk in a heavy bottom pot, stir in the lemon juice (or dissolved citric acid) and SLOWLY bring the milk to 85 to 90 Fahrenheit. 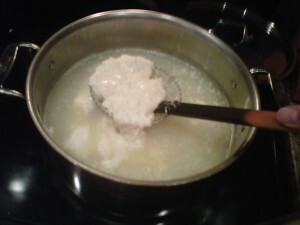 Now gently stir in the dissolved rennet tablet. And put the lid on it and walk away. Leave it alone for at least one hour. 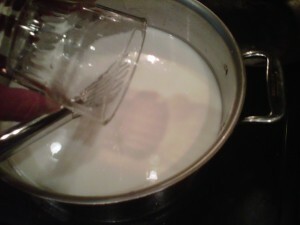 An hour later the milk has “set.” It should have the consistency of soft jello. 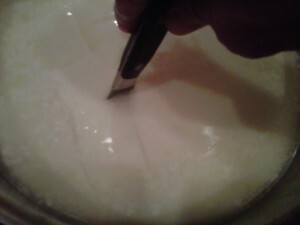 Now you need to slice the big curd into smaller curds. 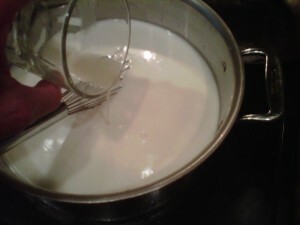 Run a thin bladed knife through the curd in both directions. 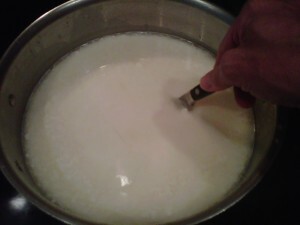 Now leave them alone for about 20 minutes… then SLOWLY heat the milk to 108 F. At this point the curds will start to clump together as the whey is squeezed out. 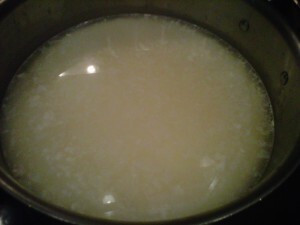 Once the liquid hits 108 remove from heat and let it sit for about 15 minutes. 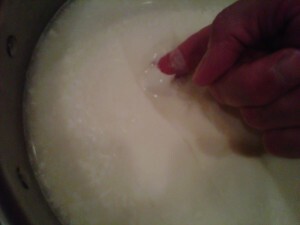 Now lift the curds out of the liquid and guess what, you’ve just made fresh mozzarella. Now we need to drop this into a strainer or into cheese cloth. I had a pizza to make. This one has chiffonade spinach, diced yellow tomato, white truffle oil, my mozzarella, Parmesan, fresh white pepper and several local eggs. Too bad I don’t deliver, right? All right, now I have to make this too. 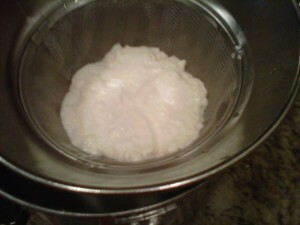 Just made ricotta. Looks delicious.